Riverdale is a shady little town. From the Black Hood's crimes to Jason's Blossom's recent murder, a lot of drama goes down and thankfully Jughead is there to seek out justice. He may have a dark sense of humor and a dispassionate disposition about many things, but when determined, he's able to overcome any obstacle in front of him. Riverdale's dark prince, it's no wonder why a grey knitted crown beanie is his trademark accessory. Become the Southside Serpent King for Halloween or just for fun with a few key pieces, like a leather jacket, white tee and this Riverdale Jughead Jones knitted cap. More than just a simple stocking cap, this accessory keeps heads warm while mimicking Jughead's unconventional style. 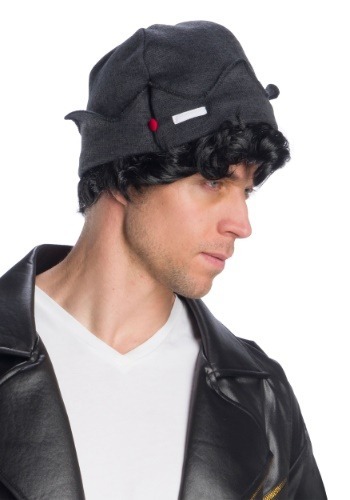 The officially licensed accessory is a gray beanie with a crown-shaped, flip-up band with black wavy hair attached to the bottom so it's like two disguises in one. Supply the mysterious and philosophical attitude and more than half of the transformation is complete. Pair the Riverdale Jughead Jones knitted cap with a Southside Serpent leather jacket then meet up with the rest of the Riverdale gang to get to the bottom of some of these mysteries. Keep in mind, we have Archie Andres and Riverdale Vixens costumes too. Standard Wig Circumference 18"-20" 18"-20"